Many people say that chihuahua puppy training is difficult. Puppy training, even chihuahua puppy training, can be lots of fun if you approach it in the right way. Training a chihuahua puppy takes time, patience and consistency, just like any other dog training. Many people look at a tiny chihuahua and don’t see a dog. Instead they see a little toy animal. This is a big mistake. Chihuahuas are dogs. They might be small and cute but they are still very much pack animals with all the same instincts as bigger dogs. Be the pack leader. You might think that this is unnecessary with a chihuahua, but it is in fact vital to show this plucky little animal who is boss. If you don’t, you might end up with a spoilt, irritable little animal that snaps, bites and is generally unpleasant. Resist the temptation to carry them around. Chihuahuas are so easy to pick up and carry that it is easy to overdo it. They have legs, so let them walk. Lack of exercise. All dogs need exercise for physical and mental stimulation. As soon as he is old enough, take your pooch for a daily walk out in the fresh air and he will be happier and healthier for it. Overfeeding. 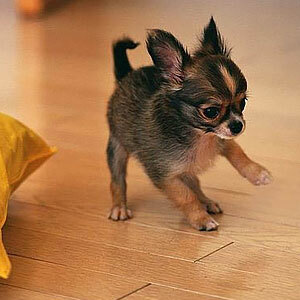 Chihuahuas are tiny dogs, with tiny appetites. Overfeeding, as well as feeding unhealthy treats, leads to obesity and health problems. Feed small meals frequently right from the start and make sure they are nutritious. One step at a time. Use one command at a time and when your puppy has mastered it, you can move on to the next one whilst reinforcing the previous one. Repetition. You will have to repeat the commands over and over until your pup understands what you want. Praise. Be lavish with praise as your dog wants to please you. Only use treats as a reward for special occasions. Consistency and simplicity. Keep the commands simple, short and consistent to make training easier. Keep it short and fun. A puppy has a short attention span so train often and for no longer than 5 – 10 minutes at a time. If you make it fun and exciting by being enthusiastic you will get further quicker. Tone of voice. When you are displeased use a stern, low voice. When you are pleased use a high, enthusiastic tone. This behavior mimics the way a mother dog would ‘speak’ to her pups. Dogs do not understand language as much as tone of voice and body language. Patience. This, above all, is a necessary ingredient when training a puppy. Don’t shout at your pup and don’t use physical punishment. Have a good time when you are training your puppy and make sure he has a good time too. It will bring you closer together and make chihuahua puppy training a positive experience for both of you.